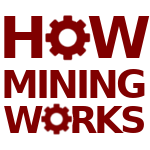 Mining and quarrying have a long and proud history of helping build our province. Materials extracted locally have been used to build our infrastructure both in centuries past and today. 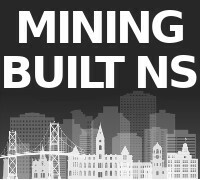 Here are some examples of well-known Nova Scotia infrastructure – buildings, bridges and roads – that the mining industry has helped build. 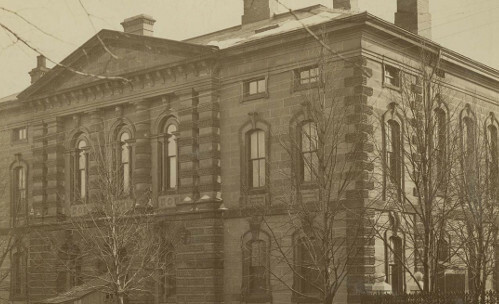 Province House, Nova Scotia’s legislature, was built with sandstone from Wallace two centuries ago. The building opened in 1819 and is Canada’s oldest legislature. The legislature’s flooring is made of marble and limestone which has visible fossils. 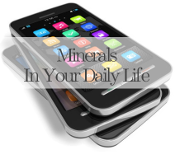 Limestone forms at the bottom of the sea over millions of years as shells and bones of marine organisms pile up. The process preserves the organisms into fossils. Left: Province House. Right: Fossils in black limestone in the legislature’s floor. The Canso Causeway links Cape Breton to Nova Scotia. 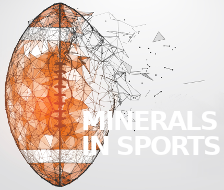 It's made of 10 million tons of rock quarried from Cape Porcupine, right next to it. They worried there wouldn't be enough rock to build the link but the cape is still being quarried today, over six decades later! 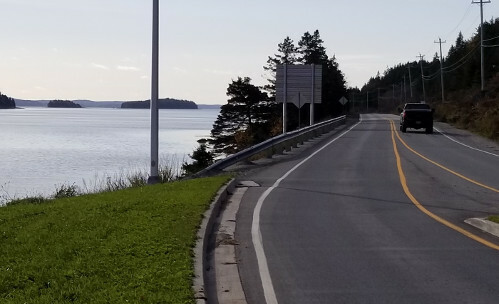 The Causeway took 10 million tons of rock to build because it's 24 metres wide at the top, 192 metres wide at bottom, and 65 metres deep in some spots. Some called it the eight wonder of the world when it opened in 1955. Today, rock from Cape Porcupine is exported to support construction in other places. For example, rock from the Cape was used to help build Disney World in Orlando! The Wave on Halifax’s waterfront is made of reinforced concrete - a frame of steel (made of iron and coal) covered with wire mesh, with concrete over it. (Concrete contains limestone and aggregate). 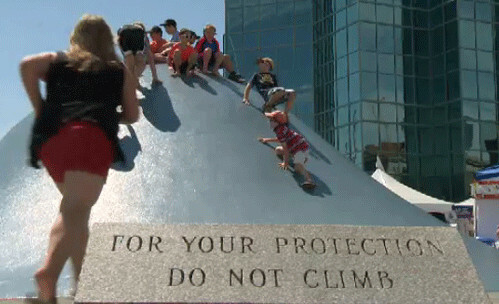 The stone carving that says you shouldn't climb on the Wave - which everyone ignores - is granite. Global steel production is about 1.6 billion tonnes per year and it's everywhere - infrastructure, vehicles, machines, etc. 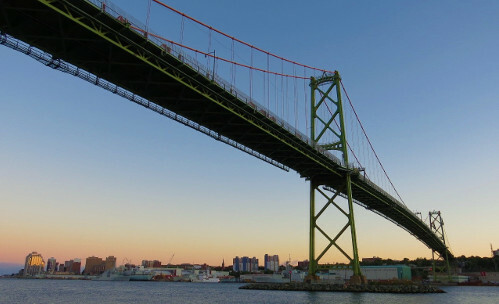 For example, many Nova Scotia bridges are made mainly of steel. You can't make steel without coal. Steel is iron and carbon, and the carbon is derived from coal.  It takes 0.8 tonne of coal to make one tonne of steel. 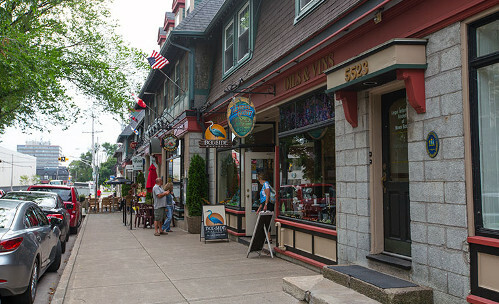 The beautiful, historic Hydrostone neighbourhood in Halifax’s north end was built to provide housing after the Halifax Explosion. The explosion, which took place December 6, 1917, levelled much of Halifax and housing was in short supply. The Hydrostone was Canada’s first public housing project. Hydrostone isn't actually stone - it's concrete block finished with crushed granite to make it look like cut stone. The blocks were manufactured in Nova Scotia’s Eastern Passage. The Morse's Tea building in downtown Halifax was built in 1841, mainly of ironstone quarried in Purcell's Cove with granite trim around the windows. Two stories made of brick were added following a 1927 fire and it’s easy to see how different the building materials were. 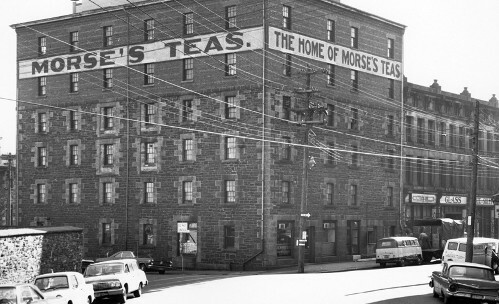 Morse's was Canada's first tea company. Ironstone was a common building material in the 1800s in Halifax because it could be quarried locally. It was not considered the most attractive building stone, so it was often “dressed up” with granite or sandstone trim. Many buildings in the Historic Properties used these materials. 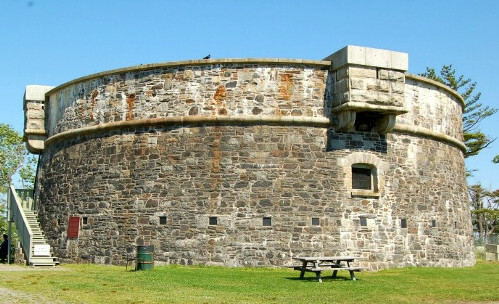 Prince of Wales Tower in Halifax’s Point Pleasant Park, also known as Martello Tower, was built in 1796-99 of rubble stone (rough unhewn rocks set in mortar). Much of the stone came from the Quarry Pond and other quarries in the park. 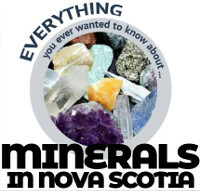 Some stone also came from quarries in Purcell’s Cove. It was the first Martello tower in the British Empire and a key step toward adoption of a standardized Martello tower design by the British military in 1804. Almost 200 Martello towers were built by the British around their empire for coastal defence. It was built on the park’s highest point so it overlooked Halifax harbour and it was a key part of the city’s defences. It was one of five Martello towers built in Halifax but is the only one that still stands. Guns were mounted on the roof and the second storey of the tower, with quarters for up to 200 soldiers. From the 1860s onward the tower was used as a self-defensible depot magazine. The tower’s garrison was never called into action to defend the town and residents. The Quarry Pond in Point Pleasant Park was a quarry in the late 1700s and 1800s, one of over 50 in the park that helped build its forts, roads and walls. It later filled with water and became the pond we know today. Small holes were made in the slate with hand-held drills. The holes were filled with explosive to blast the rock and make it possible to collect. Some drill holes can still be found at the pond. Left: Quarry pond today. Right: Hole made from hand-held drill. 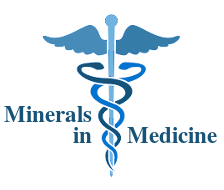 Aggregate is used in virtually all infrastructure including homes, roads, schools and hospitals. It is the main component in both concrete and ashphalt, which all modern heavy construction relies on. Building one kilometre of highway requires 18,000 tonnes of aggregate. That’s enough to fill four Olympic-sized swimming pools. 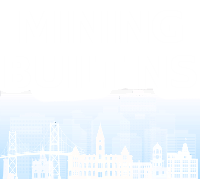 We need to extract 10-15 million tonnes of new aggregate each year to build and maintain Nova Scotia’s infrastructure. 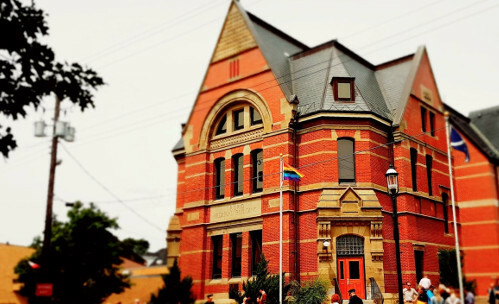 Truro town hall was built in 1884 of brick, likely from Pugwash. Carved sandstone from Wallace adorns the entrances. The building started as Truro's post office and later served as its police station before becoming town hall. 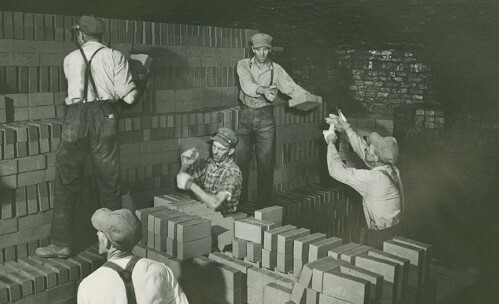 From 1880-1937 there were brick-making plants in many Nova Scotia towns that supplied their local areas. Shaw Brick started buying small plants in the 1930s but eventually only ran plants in Chipman, New Brunswick, and two Nova Scotia towns: New Glasgow and Lantz. Lantz is one of only three brick manufacturing plants left in Canada. 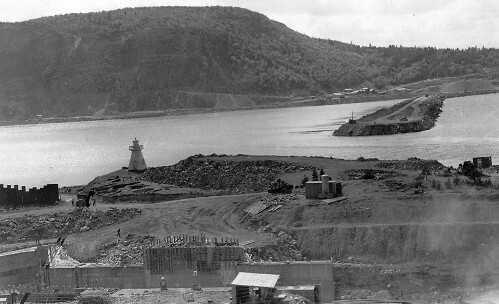 Purcell's Cove had several quarries between the late 1700s and the 1950s that provided granite, ironstone and slate for many important buildings in Halifax, including Citadel Hill, York Redoubt, Martello Tower, the Town Clock, Grand Parade, Dalhousie University and buildings at Historic Properties. 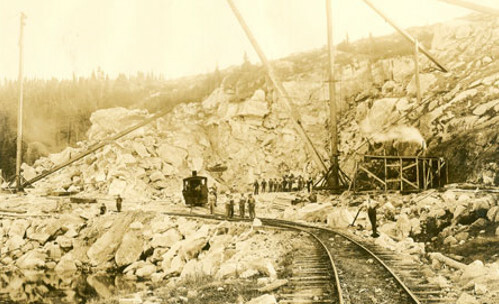 Today, the quarries are considered to be of significant heritage value. 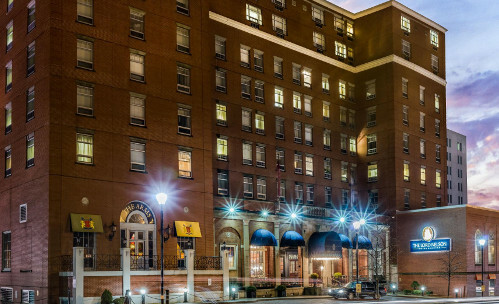 The Lord Nelson Hotel in Halifax was built in 1928 of brick made by Nova Scotia company Shaw Brick in Lantz, Hants County. Its granite steps are from Queensport, Guysborough. After several major fires, an 1857 Halifax bylaw required that large buildings be made of stone or brick. This gave us historic buildings like the Old Halifax Court House on Spring Garden Road, built in 1862 of sandstone from Wallace. Still standing 157 years later! 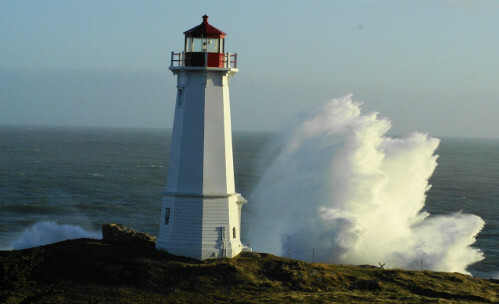 For centuries, Nova Scotia’s lighthouses have greeted those who have arrived on our shores and have helped to protect those who make their living on the water. 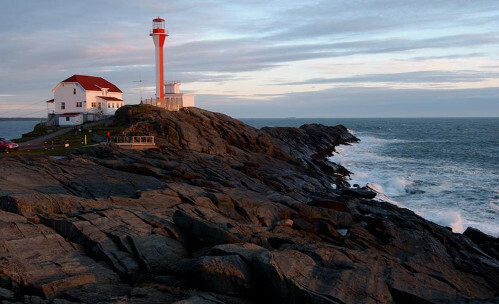 Today, there are 150 lighthouses located throughout Nova Scotia. Here are some examples. The Louisburg Lighthouse, by the Fortress of Louisburg in Cape Breton, was the first built in Canada. 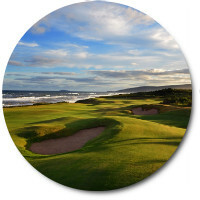 It was built by the French in 1734 of fieldstone, also known as rubble stone - rough, unhewn rocks set in mortar, but not laid in regular courses. The lighthouse had a slate roof. While the tower was made of stone, the frame for the lantern was made of wood and it caught fire and was destroyed in 1736. A new lantern was built and finished in 1738. It was designed to be fireproof – it had six pillars of cut stone which supported a brick roof. The lighthouse stood until 1758 when it was destroyed during a British attack on Louisburg. Some of the ruins of the lighthouse are still visible at the site today. A new lighthouse was built of wood in 1842 but it burned to the ground in 1922. 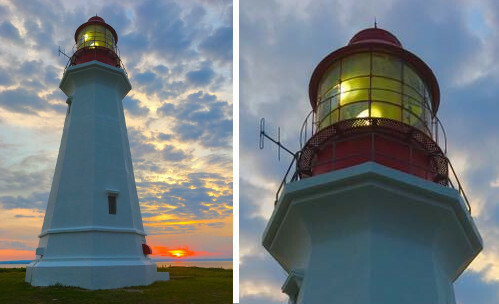 The lighthouse that stands today was built in 1923/24 and is made of concrete. Concrete is a mixture of aggregate (sand, gravel or crushed stone) and paste. Today, the paste used in most concrete is portland cement and water. The lighthouse is situated on Precambrian igneous rocks created from ash spewed into the atmosphere by volcanoes. The Sambro lighthouse at the mouth of Halifax harbour was built in 1758 as a result of an act passed by Nova Scotia's first elected government. 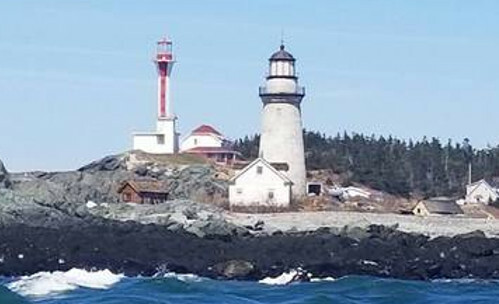 It's the oldest working lighthouse in North America. It's built of quarried granite with wood shingles around it to protect the mortar from the elements. 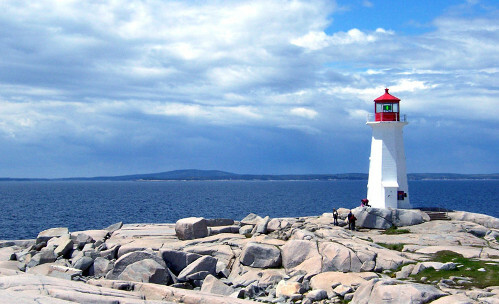 The Peggy’s Cove lighthouse was built of concrete in 1914. It is actually the second lighthouse that’s been at Peggy’s Cove. The first was a wooden house with a beacon on the roof. It was built in 1868. It was the lighthouse keeper’s home even after the new lighthouse was built. The house was damaged by Hurricane Edna in 1954 and torn down. The first Low Point Lighthouse, in New Victoria at the mouth of Sydney harbour, was built in 1826. It was wooden with a lead roof. 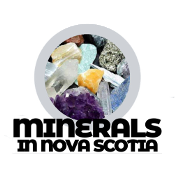 The General Mining Association was given a monopoly on all mineral rights in Nova Scotia in 1826 and it increased the amount of coal being exported from Sydney, Cape Breton. The increase in shipping activity made it important to mark the entrance to Sydney harbour and to help keep ships safe. The wooden tower was replaced in 1938 with the concrete tower that stands at the site today. The first lighthouse at Cape Forchu was built in 1839 of wood. When it was no longer structurally sound, it was demolished and replaced in 1962 with a new tower made of concrete. The new Cape Forchu lightstation (aka the Yarmouth Light) was the first lighthouse in Canada to have an “apple core” design. 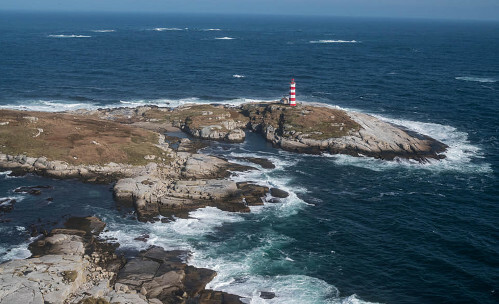 A movie called “The Lighthouse” was shot at Cape Forchu in 2018 but a fake lighthouse and other buildings were built for the set because the movie takes place in 1890. The movie lighthouse was covered with plywood and then wrapped in a thin sheet that made it look like the lighthouse was made of brick. The rocks seen at Cape Forchu are volcanic rocks that formed off the coast of North Africa. 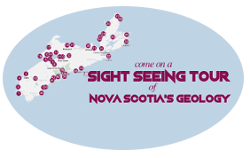 They joined Nova Scotia through the process of continental drift.